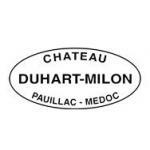 Chateau Duhart-Milon is one of the few properties in the 1855 classification of Bordeaux to lack a true chateau; the wine is in fact finished in a large warehouse off a side street in Pauillac. This does not seem to have any detrimental effect on quality, however, which is currently high, the estate having been revitalised in recent decades following its acquisition, shortly before it perhaps disappeared altogether if its rapid rate of shrinkage was anything to judge by, by Domaines Rothschild, . The origins of Duhart-Milon are somewhat obscure, and the history of the estate preceding the Revolution is lost in the mists of time. The name Milon refers to a small village of the same name, which is not far from the vineyard in the north-western part of the Pauillac commune. Duhart no doubt refers to one of the earlier owners, although there is no useful information on him, or how he came to be proprietor of the estate. Nevertheless, when the estate first appears in the texts concerning Bordeaux, early in the 19th Century, the vineyards seem to have been expansive, judging by the volume of wine produced, and the quality was also high. At this time the estate was in the ownership of a gentleman named Mandavy, until during the 1830s when he died. At this point it seems to have then been divided, some coming into the possession of Pierre Castéja, some to a Monsieur Duroc. It was not long, however, before Castéja took control of the whole estate, and during his tenure the property was deemed a quatrième cru when classified in 1855. His descendents ran the estate after his death, employing André Delon, who also ran the show at Léoville-Las-Cases, as manager. But it is a familiar tale; war and depression inhibited investment and development, and with the passage of time Delon and the Castéja family were forced to sell off some vineyards, whilst the vines in others grew old and died. The proprietor of Batailley (before the split that gave rise to Haut-Batailley) bought 15 hectares. In the post-war years the vineyard covered a bare 17 hectares (on an estate covering 110 hectares), and the wine was as good as nonexistent. The property passed through the hands of five different owners in just a quarter of a century, this lack of continuity only serving to worsen the situation. When it was rescued from an ignominious end by the Rothschild family in 1962, the estate was in need of massive reinvestment. The vineyards were completely cleared, drainage installed, and new vines planted in a similar proportion to that found at Lafite-Rothschild. The estate and vineyard expanded dramatically with the purchase of new plots and an active program of replanting, the vineyard reaching 42 hectares in 1973, and was up to 71 hectares by 2001, on an estate that now covers 152 hectares. Today the vines, which are harvested by hand, remain predominantly Cabernet Sauvignon (69%), with 28% Merlot and 3% Cabernet Franc, on fairly typical soils of fine gravel, mixed with Aeolian sands, on a tertiary limestone bedrock. These vines are now nicely mature, just one part of the explanation for the consistent improvement seen in the wines over recent years and decades. Then came revitalisation in the chai, which is not located on the estate, but at the aforementioned warehouse. New enamel lined equipment was installed, followed subsequently by stainless steel vats, and the wine sees a temperature-controlled fermentation with a cuvaison of up to 25 days. After malolactic fermentation the wine goes into oak barrels (produced in the cooperage at Lafite), the length of time depending on the cuvée. The wine is racked every three months, and then fined using egg whites before bottling. 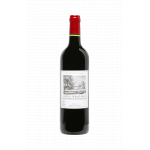 The blend for Chateau Duhart-Milon the grand vin (typically 20000 cases per annum), is dominated by Cabernet Sauvignon, typically 80 to 85%, the balance Merlot. It goes into oak for up to 18 months, with usually in the order of 50 to 55% new barrels each vintage. There is a second wine, introduced in 1986, called Moulin de Duhart (typically 6000 cases per annum). This is a much more even blend, with typically 60% Cabernet Sauvignon and 40% Merlot, and it will spend up to ten months in two year old barrels before bottling. As is often the case, some lesser wines are sold off for blending as generic Pauillac. Having tasted a small selection of vintages over the years (admittedly none for some time) the improvement in quality has been tangible. The 1982 was a good wine, but not quite of the standard one might expect from what is frequently hailed as one of the greatest vintages of the late 20th Century. It was outshone by the 1996, which might not surprise us too much, but also the 1998, which is more surprising. But the vines by this time have another sixteen years on them, and the vineyard and chai have seen another sixteen years of investment. These are good wines, and in very recent vintages the wines are reputed to have taken on an even greater dimension. Along with the other Rothschild estates, the wines of Duhart-Milon are now, once again, worth looking out for.